COMMENTARY ON "JESUS MINGLED WITH PEOPLE"
I know that sounds quotable. I know it would sell a lot of coffee mugs if you slap it on the side and put it on a lifeway shelf. But just think about it for a minute, what was Jesus really? Jesus Christ is God in human flesh. He is perfect in every way, and it is only by his perfection that we can be saved. That’s not you, that cannot ever be you. The scripture is clear that all have sinned. So if your aim is to be Jesus for somebody know that at best you will be committing the sin of blasphemy by lowering Jesus to your level. You cannot be him, you can only lie and raise yourself up in your own mind or blaspheme and lower him to your level. If you want someone to have Jesus give them the real thing, which isn’t you. Preach the law so they know they need Jesus and then tell them what the real Jesus did for them. Sinners need the real Jesus, not a false Christ pretending to be him and offering platitudes and pietism. This lesson gives us a false law and a false Gospel. Notice they couch the gospel in social outreach and connection by exegeting Ellen White instead of prescriptive scripture. To understand the “ordo saludis” that is, order of salvation, one must first understand original sin. The sinner is dead in trespasses and sins (Eph 2:1). It defines this deadness as something that is part of our nature (Eph 2:3) and with us from the womb (Psa 51:5). Trying to win souls with kindness and friendship is like asking a corpse to get up and walk. We are dead as a doornail in sins. Nothing is going to raise that up save Grace (Eph 2:8) and that is only taught in scripture to come by objective means (Rom 10:17). If it were true that friendship and kindness saved souls then I guess Mormons have it right. Nobody does more good works and acts of kindness in the flesh than them. You can’t earn salvation and you don’t have the power to trick anyone into accepting it. Only the Grace of God can raise up their dead bones and make them walk in faith. If you want to save souls let Jesus do the work by the preaching of the Law to show them that they need it and the Gospel to raise their soul. This is a work of God not a work of man (Eph 2:8-9). The thesis of this lesson is decision theology. 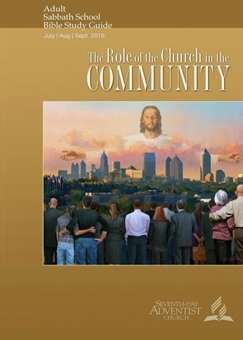 The author is presenting the salvific role of making a decision for Jesus in the order of salvation. Don’t misunderstand me, I’m not saying that acts of Piety even to include moments of making a decision are not part of the Christian life. Such things though should properly be understood as Good Works. The Bible does call us to good works and does speak of such things happening. In yesterdays commentary I presented original sin, and then God’s act upon man in the creation of faith in the believer through objective means. Specifically, I pointed out the preaching of the Word. When this happens faith is created in the heart of the hearer (Rom 10:17). We know this is true because the scripture says it is. In the Christian life we expect good works to come after wards, in a subjective sense. Look at the very next verse after Eph 2:8-9 that I presented yesterday. I will highlight it for you. Good works are a thing, if you want to call making decisions for Jesus a good work I won’t get in your way. I would argue it’s a rather weak one but I wouldn’t take that away from someone altogether. We should not look to a decision moment though as a moment of salvation. Why? Because then it’s like you’re saying that you helped Jesus save you. I guess he couldn’t pull it off unless you came through in the last moment with you decision could he? He just isn’t powerful enough?... really? If the scripture is correct in that you’re spiritually dead in trespasses and sins then you can’t expect to capable of any spiritually good act prior to the reception of faith, up to and including the making of decisions. Trust in Christ, who has created faith in you and saved you, not in yourself. If you made a decision it’s only a reflection of what he already did to you in his Grace. The author of this days post makes the same mistake in twisting the narrative that modern liberals do with scripture. They juxtapose Jesus interactions with the “lower class” against religion, specifically that of the Jews. Keep in mind, Jesus was Jewish too. There was nothing wrong with following the Torah, even in it’s ceremonies. They are good things. The so called sinners Jesus was eating with were no longer sinners, they were covered in the righteousness of Christ. They had repented of their sins and stood righteous and blameless in faith. The Pharisees on the other had were impenitent and their hearts were hardened to the Word. Their ears were dull and they could not hear. We see this reflected in the fact that they ascribe the work of Christ to that of the Devil(). They don’t believe in Jesus because they have no faith. They have no faith because it has not been given to them, and it was not given to them because their hearts were hardened. When you understand that decisions don’t play into the reception of faith but are only a reflection of it’s presence or absence the scriptural teaching of Sola Fide, faith alone, starts making sense. Isn’t it just nice how the author places the responsibility of expanding the kingdom of God on the reader? I guess if people are not converting to Christianity around you then you just are not doing your job right and God’s will isn’t getting accomplished. He isn’t powerful enough afterall, he needs you! I ask the reader to keep in mind that if God does ever choose to use you in his free will to preach law and gospel to someone count yourself blessed, not God. He isn’t limited by you, and if he does choose to use you it is an honor. The scripture teaches that none can pluck God’s sheep from his hand, and that each of them were individually selected a very long time ago. Take comfort in this and trust in Christ, not in yourself. Today’s lesson serves up an extra helping of law. In case you didn’t know, if your church isn’t growing it must be your fault for not outreaching to the community enough. Bear in mind, the author has not taught any means of Grace yet. It is entirely up to the reader to find ways of tricking people into the fold with friendship and piety. So it is not God’s work you are trusting in but your own, and the only instructions you’re given is to avoid doctrine and worship and focus on outreach, but we aren’t really going to say what outreach is because to do that we would have to start discussing doctrine and worship… I guess. The author wasn’t clear I’m left putting the pieces together. So instead I will wrap up my points made in commentary on the previous days of the week. You can’t trust in yourself or your outreach. God is the one who performs the work, if you are blessed and honored to be in the position to preach law and gospel to someone, then do so. And know that no matter the outcome God has promised to work in that. You can’t save yourself with your good works, so there is no reason to believe you can save anyone else either. For one to believe in God they need faith, and this only comes by the work of God. Your piety doesn’t even help slide it along, you take no credit for your salvation or anyone elses. Once again the author brings up salt and light from the Bible. As do many Christians today he teaches salt and light as good works. I challenge the reader to see these things as the Word of God. If the Church preaches the Word then we know that God will work in it and it will not return void (Isa 55:11). But if the Church twists the Word, and teaches something that is not taught in it we have no such promise. And thus the salt has lost it’s saltiness. It is no longer efficacious in the creation of faith. God has not promised to work in a twisted Word any more than he has to create faith through piety and good works. If the TV preacher is preaching prosperity and good fortune, know that there is no promise associated with that message. If the pastor is preaching the latest movies and withholding law and gospel this summer, consider taking your family somewhere else. There is no Gospel there. If your preacher is preaching salvation by keeping the Sabbath as the remnant faith in the end times, know that there is no salvation in that false Gospel either. Trust in Christ and Christ only for your salvation, he died for you to save you from death and Hell. You don’t need anything else, just Jesus. And this is a Word, a message that the scripture does teach. You can trust that it does work independently of the one speaking it through the actions of God, not of man. Copyright 2016 BibleStudiesForAdventists.com. All rights reserved. Revised August 1, 2016. This website is published by Life Assurance Ministries, Camp Verde, Arizona, USA, the publisher of Proclamation! Magazine. Contact email: BibleStudiesForAdventists@gmail.com.